When a young taxi driver is killed, his consciousness jumps into his killer’s body. He then learns he can do that as often as he wants. Believing he can’t truly be killed by anyone, he sets out to confront evil. But with each new body, he drifts further away from his identity until he questions his own sanity and purpose in life. My name is Marko Santana and I have been killed many times. You see, each time I am killed, my mind jumps into the killer’s body and I take over. It’s weird but simple: if someone kills me, I get their body. So does that make me the ultimate crime-fighter? Maybe a cool body-snatcher kind of guy? Or nothing but a freakin’ brain parasite? Personally, I prefer to think of myself as the ultimate survivor—with a serious personality disorder. I am not your father’s punch and run superhero. I am a problem in motion—and for better or worse, I am on the road to being seriously mental. Join me on my quest for purpose and sanity as I journey through life in other people’s bodies. For these are the chronicles of one who feeds on killers—my killers. These are the chronicles of Marko Santana. Born in Texas. Died all over. Read the first several chapters for free: Preview I, Target Now! 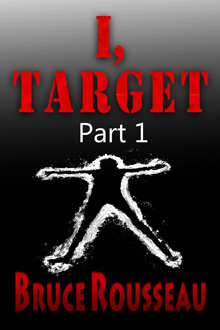 I, Target is a 5-part urban adventure series and each part must be read in order. Each part is approximately 130-190 pages. The completee I, Target series is also available in its entirety as an ebook and a 600 page trade paperback novel.